Girls Mountain Biking | Fit Families | Kids VT - small people, big ideas! Twenty girls clad in bike shorts and colorful cycling jerseys stood in a circle at the Catamount Outdoor Family Center in Williston, sharing creative names they had just made up for themselves. Names like "Magnificent Maddie," "Awesome Ada," "Monkey Mae" and "Excited Emma." 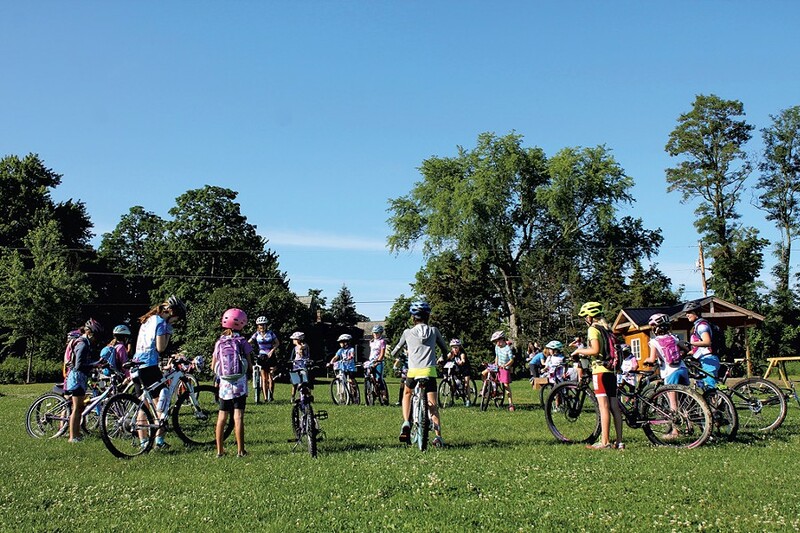 Ice-breaking activities like these help get them in gear at the center's weeklong mountain-biking camp for girls ages 7 to 12, run by the organization Little Bellas. "This is the vibe," said Madie Ahrens, a rising sophomore at the University of Vermont who serves as a Little Bellas mentor — the title given to the organization's instructors. "It's goofy from the start. We're gonna sing Taylor Swift. We play a lot of games on the trail. There's lots of dance parties." The campers took a break to apply sunscreen, then circled back up for a bike-safety and helmet check. Afterward, a mentor yelled, "Let's go do some yoga!" and the girls hopped on their bikes and pedaled down a grassy trail to a serene spot. There, they practiced poses that addressed balance, focus and calming their nerves — all things that apply to mountain biking. Little Bellas, with its slogan "mentoring on mountain bikes," is the creation of sisters Sabra and Lea Davison, Vermont natives and professional mountain bikers (Lea was named to the 2012 and 2016 U.S. Olympic mountain bike teams). As they toured the country racing, the pair noticed a significant gender disparity on the starting line. While attending Middlebury College in 2007, they teamed up with another prominent Vermont rider, Angela Irvine, to start Little Bellas to give more females the opportunity to experience mountain biking. In 2008, around 40 girls participated. Since then, the program has expanded beyond Vermont and grown steadily. 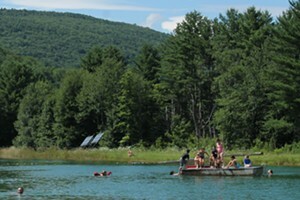 This summer, 530 girls and counting signed up for day camps and overnight programs in Vermont, Massachusetts, Colorado, Pennsylvania, California, Utah and Georgia. Through Little Bellas, girls are empowered to overcome their fears and challenge themselves, using their bikes as a tool. "These are important life skills for any developing kid," said Sabra Davison. "We spend a lot of time cultivating a space where all girls are equals, feel improvement and can be themselves." Back at camp, the girls moved from yoga to a group bike ride. Mentors used this time to assess campers' abilities so they could plan small-group rides for later in the week, where girls of different levels would be grouped together to encourage camaraderie on the trail. The playfulness continued during the group ride. Girls practiced balance, correct body positioning and going gentle on the brakes by playing a game called Dab Sharks, which challenged riders to stay on their bikes despite distractions from other campers. Bike Limbo, an activity in which girls rode under a snake-shaped tube, taught them to get low and move back on their seat with wide arms, the "power position" for trail riding. According to Ahrens, the girls push each other to try new things, like a tricky bridge crossing or a rock drop. "They'll say, 'It's not that bad, give it a try!'" Ahrens said. Midweek, the girls also have the opportunity to ride without adults. Groups of three to five campers get a watch, a time limit and the freedom to do what they choose. There is only one trail entrance and exit, so mentors know the kids are safe and won't get lost. The girls can ride together or sit on the side of the trail and relax. They hear 'no' all the time," said Ahrens. "This gives them a chance to make their own decisions. And they come back really stoked, like, 'We rode Cliffs of Insanity nine times!'" Little Bellas offers girls' mountain biking camps at locations around the country, including Williston and Craftsbury. To find out more, visit littlebellas.com.